Vladimir Putin is isolated and shunned: That makes the Russian president even more dangerous. The Russian president is isolated, shunned, and ignored. And that makes him even more dangerous. Russian President Vladimir Putin speaks during a press conference at the G20 summit on Nov. 16, 2014, in Brisbane, Australia. If last week Vladimir Putin was 99 percent sure that the West was out to get him, he now knows it with complete certainty. Over the weekend, Western leaders at the G20 summit in Brisbane, Australia, did their utmost to criticize and ostracize the Russian president over his actions in Ukraine. Fed up, the leader of the world’s ninth largest economy skipped breakfast on Sunday to fly home early. Even before the summit, Australian Prime Minister Tony Abbott had vowed to “shirt-front” Putin (i.e., tackle him according to the practice of Australian rules football) over the downing of Malaysia Airlines Flight 17. Canadian Prime Minister Stephen Harper reluctantly shook Putin’s hand, telling him “to get out of Ukraine.” And President Obama, in a speech to students at the University of Queensland, mentioned the global threats of Ebola and “Russian aggression” in the same sentence. “Attack on Putin at G20 Summit” was a headline in the Moscow tabloid Moskovsky Komsomolets. The newspaper described a “psychological attack” on Putin that began by assigning him to the ageing Hilton Brisbane, hardly worth its four stars, according to Russian diplomatic sources. When Putin arrived, backed up by four warships from Russia’s Pacific fleet, other participants avoided talking to him at public events and largely left him on his own. For the summit’s family photo, Putin was placed on the far edge, next to South African President Jacob Zuma, Moskovsky Komsomolets sniffed. Putin put on a brave face before running for the airport, praising Abbott for creating “a very positive atmosphere” and maintaining that there was a gulf between media coverage of the summit and reality. Then Putin—who has cultivated an image that is part he-man and part Energizer bunny—fibbed a little more that his early departure had to do with the 18-hour flight back to Moscow and his desire to sleep “at least four or five hours” before returning to work Monday morning. Russia’s state-run Channel One later downplayed Putin’s humiliation, celebrating him as a statesman who trotted the globe to break U.S. hegemony and forge new relationships with China and India even as the leaders of Britain, France, and Germany sought his counsel. The whole Brisbane fiasco may resemble a junior high school lunchroom drama, yet the roots run deep and the consequences are serious. Putin has felt shunned by the cool kids at least since 2001, when he reached out to George W. Bush in the aftermath of Sept. 11 and was rewarded for his efforts with the Iraq war and the promise of a U.S. missile defense system based in Eastern Europe. Putin’s successor after two terms, Dmitry Medvedev, basked in the pomp of international summits—and especially the attention that Obama lavished on him as part of the “reset” in U.S.–Russia relations. But when Putin returned to office in 2012, having used Medvedev to bypass a constitutional restriction on three consecutive presidential terms, the magic was gone once and for all. After weathering a winter of anti-government protests, which he blamed then–Secretary of State Hillary Clinton for instigating, Putin was in no mood for making nice. Freshly inaugurated, he announced he was too busy to attend the G8 summit in the United States. Instead Putin pointedly made the first foreign trip of his new term to Belarus before continuing on to Germany. Later that year, Obama canceled his attendance at the Asia-Pacific Economic Cooperation summit in Vladivostok, Russia. The Russian president cut an isolated figure at the subsequent G8 meeting in Northern Ireland over his uncompromising support for Syrian leader Bashar al-Assad. And by the time Putin was supposed to host this year’s G8 summit in Sochi, his country had been kicked out of the group for annexing Crimea. A new definition for awkward could be “encountering Putin at an international meeting.” Obama tried his best to ignore Putin at the opening of the APEC summit in Beijing that preceded the Brisbane gathering. Unavoidable meetings, such as the 70th D-Day commemoration in Normandy in June or the G20 summit, are being used mainly to impress on Putin the need to withdraw support for pro-Russian rebels in eastern Ukraine and come to terms with the government in Kiev. The feeling of awkwardness is mutual. Putin has already indicated he is cutting short all nonessential travel, including to the World Economic Forum in Davos next year and a nuclear security summit in Chicago in 2016. Besides Belarus and Armenia, the only European country where Putin can expect a warm welcome is Serbia, a historical Russian ally that is on the slow track to European Union membership and is still smarting from the loss of its province Kosovo. Putin’s October visit to Belgrade, which was honored with a military parade, was an unsubtle reminder that the Kremlin hasn’t forgotten about the Balkans, even if the EU has. Putin’s isolation points to a larger problem and one of the greatest failures of his presidency: namely that Russia has practically no allies left. The reason isn’t that NATO has forced most of Eastern Europe under its yoke, but that Putin’s foreign policy is a zero-sum game where Russia’s enormous soft power—culture, language, knowledge—plays a nonexistent role and everything comes down to crude economic levers and, if need be, force of arms. Ukraine is only the latest example. Putin’s push to create a “Eurasian Union” with landlocked neighbors, starting with Belarus and Kazakhstan, is not as much an attempt to resurrect the Soviet Union as to mimic the EU and enhance his own prestige. Next year Russia will hold the rotating presidency of the Shanghai Cooperation Organization, a regional security group that also includes China and four Central Asian republics. With its nebulous purpose and lack of obligations, the SCO is a pale substitute for a real alliance. China is the key to the Kremlin’s eastward pivot, whether for real or only for show. For the better part of the last decade, Putin has been making annual pilgrimages to Beijing at which deals measured in billions of dollars, barrels of oil, and cubic meters of natural gas are announced. Right before the APEC summit this month, Putin oversaw the signing of the second landmark natural-gas agreement this year. While an oil pipeline to China is already open, and construction on a natural-gas pipeline has begun, doubts linger as to the economic viability of the megaprojects. China has nothing to lose from Russia’s advances and is hardly opposed to the impression of a new “strategic partnership” to offset the United States. But while Russia fulminates on the international stage and struggles against economic decline at home, the Chinese leadership stays a pragmatic course, driving a hard bargain for Russian resources while calibrating its complex economic relationship with America. Of course Putin’s growing isolation isn’t good for anyone; it’s dangerous. In the “power vertical” he has built over 15 years, Putin has become the personification of Russian power. He faces neither an opposition nor a real parliament, and the last independent media inside Russia—Ekho Moskvy radio station, Dozhd TV channel, and Vedomosti newspaper—are at risk of being crushed. 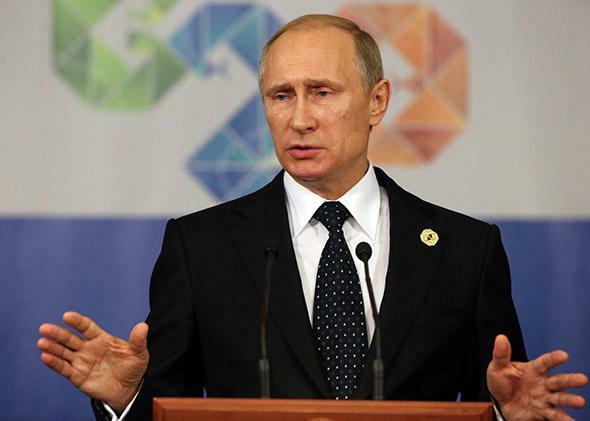 Any decision involving Russia must meet Putin’s approval if it’s going to succeed. New sanctions against Russia will decrease the West’s influence and give Putin even less to lose. At the same time, he knows the West isn’t ready to go to war. The biggest dilemma is how to talk to Putin, now that he has become a pariah.